You want control! Right? Whether it's at work, in your business, at home, or in your social life, you want to choose what you do and who you become. But many people fall short in their efforts to make changes and influence outcomes. They may give something a brief try but, when they run into their first challenge, they quit. The return on this kind of investment is clear, nothing changes! 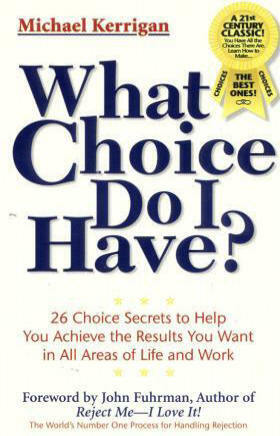 This book gives you the tools you need to make choices that can empower you to better direct your life. Taking responsibility for where you are and where you are going, and making appropriate choices, will help you gain greater control over your dreams, thoughts, actions, and results. ● Separate your past from your potential so you can go for your dreams. ● Set goals appropriate to what you want to accomplish. ● Upgrade your interaction skills with others so you can build better relationships. ● Counsel yourself and manage your activities to accelerate your progress. Read What Choice Do I Have? and learn how to make better choices and more effectively take charge of your life, so you can achieve what you want!